I’ve been hitting the seltzer hard over the summer, generating bags of empty bottles for recycling. A pet peeve of mine is that it is darn near impossible to get the full deposit back on bottles and cans in LA. I have confirmed with friends back east that it is still common practice to recoup the full amount on their recyclables anywhere that sells beverages. Not so here. Only the homeless brave the long lines at the one location in the east valley that has a machine. I admitted defeat after waiting for two hours, at which time the Recycle Nazi shut the hut down for a lunch break (he pointed to the sign where the hours of operation were posted for emphasis). There was also a cop posted next to the hut. Presumably this level of security is warranted by the commensurate level of frustration experienced by the those of us waiting in line. Now, instead of joining the ranks of angry people, I trundle my recyclables to a local joint where the proprieter weighs the lot, punches some numbers into a calculator and gives me a small fraction of what it is worth. At least there’s no line. One day, while contemplating one of my near worthless empties, I thought, “what could I make out of this”? 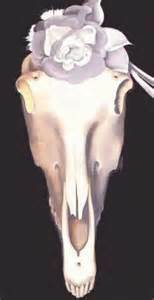 Upside down, it sort of looked like the shape of a deer skull. With the help of scissors, wire, newspaper and duct tape, I fashioned the armature . Lots of papier mâché and paperclay later, the deer skull started to take shape. My husband suggested the addition of the rose as an homage to Georgia O’Keeffe. No animals were killed to make this skull, just one bottle…redeemed at last! 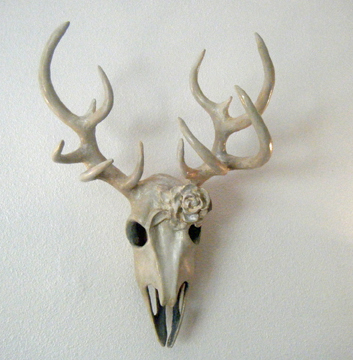 The first Vegan Deer Skull with White Rose sold at the Hearts and Flowers show at the Folk Tree in Pasadena. 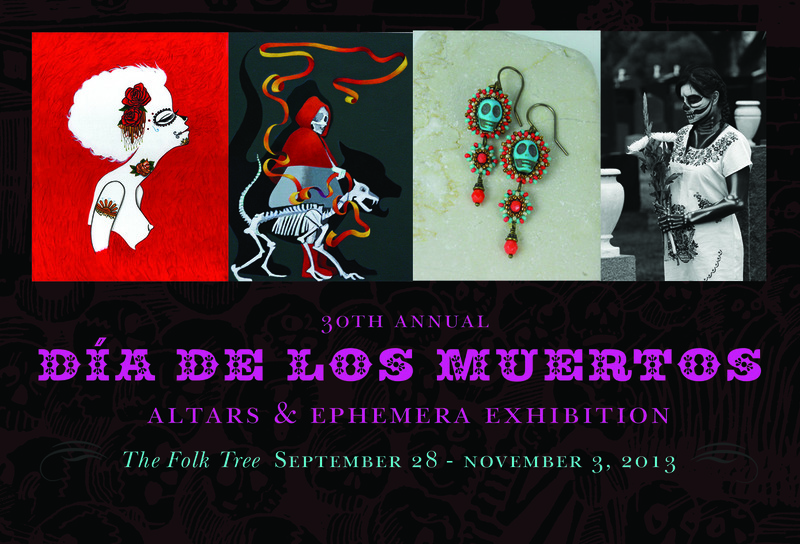 The one shown here is on display as part of The 3oth Annual Dia De Los Muertos Show at the Folk Tree from September 28th to November 3. Gail Mishkin notified me that this piece has already been purchased by a person who saw it posted on the Folk Tree Facebook page. No worries, I have another one in the works. Each one is a little different.